Mitsis Group of Companies (“We”) is a group of Hotels incorporated in Greece. “We” are committed to protecting and respecting your privacy. We are committed to preserving the privacy of all visitors to https://www.mitsishotels.com (the “Website”) and to protecting any personal information that you may provide to us. You may reach the Data controller at dpo@mitsishotels.com. We may collect personal information about you when you use our website, and otherwise interact with us. The information we collect falls into three categories: (a) information you provide us; and (b) information we collect through automated methods, and (c) information we collect from other sources. Our Website may collect information about the exact location of your mobile device or computer using geolocation and technology such as GPS, Wi-Fi, Bluetooth, or cell tower proximity. For most mobile devices and computer systems, you are able to withdraw your permission for us to collect this information by using the device or web-browser settings. If you have any questions about how to prevent us from collecting exact information about your location, we recommend you contact your mobile-device service provider, the device manufacturer, or your web-browser provider. Our Website may not work properly without information about your location. If you would like us to delete information we have collected which could identify your location, please contact us at the address, phone number or email address below. To provide you with the information or services you have requested and for internal customer administration and business purposes. 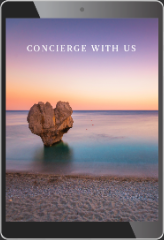 If you consent to receive marketing material from us, we may use your data to send you marketing and other materials relating to Mitsis Hotels. We may also use your data, or permit selected third parties to use your data, to provide you with information about goods and services which may be of interest to you and we or they may contact you about these. We do not disclose information about identifiable individuals to our advertisers, but we may provide them with aggregate information about our users. We may make use of the personal data we have collected from you to enable us to comply with our advertisers’ wishes by displaying their advertisement to that target audience. The data that we collect from you shall not be transferred to, and stored at, a destination outside the European Economic Area (“EEA”). We may share your information with vendors who provide services to us, such as fulfilling orders, providing data processing and other information technology services, managing promotions, contests, prize draws and sweepstakes, carrying out research and analysis, and personalizing individual customer experiences. We do not allow these vendors to use this information or to share it for any purpose other than to provide services on our behalf. There may be times where we may share information when it does not directly identify you. For example, we may share anonymous, aggregated statistics about your use of our Website. Or we may combine information about you with other customers and share the information in a way that does not identify you. We have the right to use or share information as necessary to keep to any law, regulation or legal request, to protect our Website, to bring or defend legal claims, to protect the rights, interests, safety and security of our organization and our employees, or users of the Website, or in connection with investigating fraud or other crime, or violations of our policies. Under the applicable legislation you have the right to request access to the personal data we hold about you, i.e. to be informed upon your request whether your personal data are subject to processing and to receive further information on such processing, including information on eventual transfers of personal data outside the EU and the appropriate or suitable safeguards we have in place for such transfer. As long as the requirements under the applicable legislation are met, you may also request the correction of any inaccurate information we hold about you or the deletion of the same or restriction of the processing concerning your personal data. If such a request places us or our affiliates in breach of its obligations under applicable laws, regulations or codes of practice, then we may not be able to comply with your request but you may still be able to request that we block the use of your personal information for further processing. You may also have a right to data portability to another data controller under certain circumstances. You may withdraw your consent at any time. The withdrawal of your consent will not affect the lawfulness of processing based on consent before its withdrawal. You may also lodge a complaint with the competent Data Protection Supervisory Authority, if you feel that the processing contravenes the law. Our Website may, from time to time, contain links to and from the websites of our partner networks, and advertisers. If you follow a link to any of these websites, please note that these websites have their own privacy policies and that we do not accept any responsibility or liability for these policies. Please check these policies before you submit any personal data to these websites.